Children are fascinated by the characters of our modern mythology - Santa Claus, the Tooth Fairy, the Easter Bunny. And yet, there is no clear story that we all tell our children about how these characters came to be. 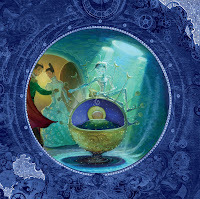 William Joyce has created a wonderful series about these characters called The Guardians of Childhood. 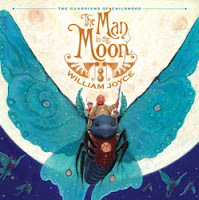 My students have loved the magical picture books that Joyce uses to launch this series - The Man in the Moon and The Sandman. Theses stories are now continued with the movie, The Rise of the Guardians. As a baby, the Man in the Moon (MiM) was watched over by his guardian, the faithful Nightlight. When the evil Pitch, King of the Nightmares, decides to make this innocent baby one of his own, an almighty battle of good versus evil erupts. The valiant Nightlight swears to protect MiM, sacrificing his life in the process. The Man in the Moon does survive, but he is all alone - until he discovers that he can hear the hopes and dreams of the children of Earth. William Joyce captures young readers' attention with bold, dramatic illustrations, alternating between saturated colors and stark grey tones. But what really struck my students was the message behind the story. There was a sense of awe and quiet as we ended the story with the Man in the Moon vowing to protect the children of Earth. This story resonated with the children on a deeper level - a sense that the moon is always there as their nightlight, reassuring them when nightmares might visit. The book trailer below does a nice job of introducing the picture book in a dramatic way. I share this story each year with 2nd graders as they study a "good guy vs. bad guy" creative writing unit. The Guardians of Childhood Book Trailer from Moonbot Studios on Vimeo. 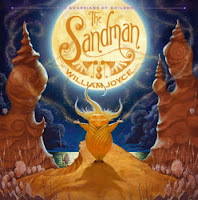 The story of the Man in the Moon is continued with Joyce's newest picture book: The Sandman. This adorable little fellow sends us all to sleep, protecting us from nightmares and fear. Children have responded to his mighty battle with Pitch and to his promise to keep us safe. 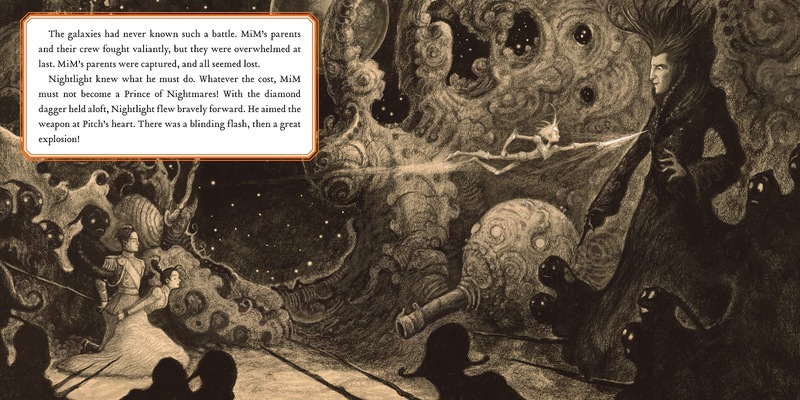 Again, Joyce's illustrations heighten the dramatic battles and the magical feel to the stories. But it is the heart and message that brings children back to these again and again. My children and I enjoyed the movie The Rise of the Guardians. The animation was wonderful, and the humor invested in each of the characters gave them depth and staying power. But the chase scenes dominated the storytelling, as so often happens in animated movies. I am sure that gives young viewers satisfaction, but it left me wanting a bit more. I am looking forward to seeing how my students enjoy the novels based on this series. I am fascinated by the way Joyce has created a complete story-world, using picture books, novels and movies to tell different stories within the same series. Early reports indicate that the novels appeal to 4th through 6th graders who love detailed fantasies. The review copy was kindly sent by the publishers Simon & Schuster. If you make a purchase using the Amazon links on this site, a small portion goes to Great Kid Books (at no cost to you!). Thank you for your support. Young children love learning about the world around them. 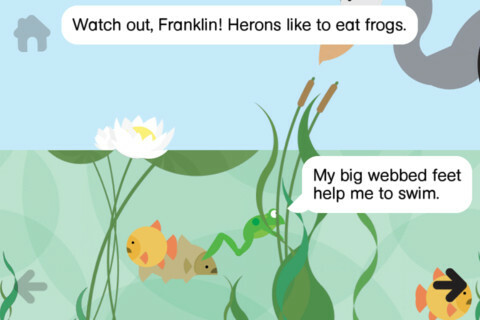 This app does a beautiful job introducing preschoolers and kindergartners to real facts about frogs, from their habitat to feeding to metamorphosis, through an appealing story about Franklin Frog and his offspring. It draws children into the story, as they guide the frogs with their fingers. Children make the frogs jump, swim, catch flies, avoid predators, find a place to hibernate, croak to attract a mate and more. 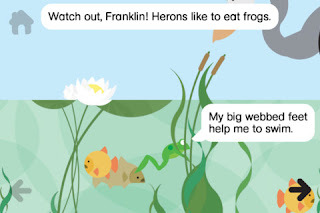 This app always feels like an exploration of how a frog lives, and never feels like a game. As the Horn Book review says, this app presents the information in "an accessible way that’s respectful of both its subject and its audience." Every time I read and explore this app, I am utterly amazed at the adventures these stories share. This app features five amazing stories ranging from mountain climbing in Yosemite to crossing the Antarctic by dogsled to climbing down into a volcano. 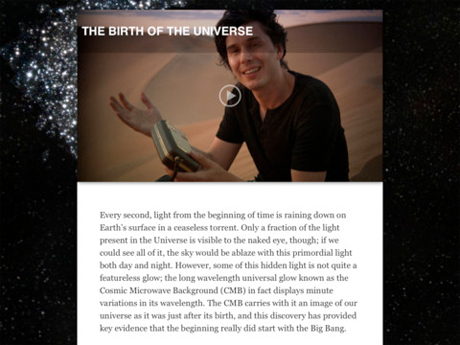 Each story hooks readers with a short video, but then encourages them to read beyond this initial video to learn more. Text is interspersed with high quality photographs and interactive graphics. Readers scroll in different ways, vertically and horizontally - this keeps readers stimulated and engaged. The interactive graphics let you discover more - for example, a timeline with a sliding bar lets readers explore the different types of climbing gear used over the past 100 years. But most of all, I was impressed with the way readers got a sense of the real people involved through quotes, video and audio. It conveys a first-hand point of view in an exciting, engaging format. The Wonders of Geology combines stunning photography, clear descriptions, and a combination of text and audio narration to teach tweens and teens about how the Earth's great mountains, valleys and other geological features were formed. 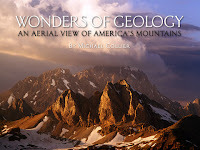 Collier's breathtaking photographs draw readers in and convey a sense of awe at the wonders of these spectacular sites. The app switches between concise written paragraphs that introduce a subject and longer narrated segments as viewers look at photographs or diagrams. This helps tweens and teens who are curious about a topic but perhaps not determined enough to read in-depth nonfiction text to learn more about the subject. 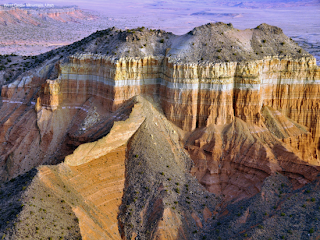 Collier shares his passion and in-depth knowledge of geology, as well as his stunning photographs. While some students may want more interactive features, I believe that others with an interest in the subject will be fascinated. 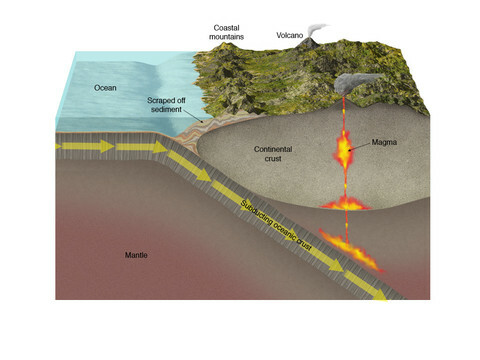 It would make an excellent complement to a standard textbook for 6th graders studying Earth Science. 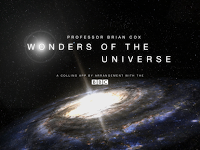 Particle physicist Brian Cox brings astrophysics to a general audience with the amazing Wonders of the Universe app, bringing together his books Wonders of the Solar System and Wonders of the Universe with his award-winning TV series produced by the BBC. The app uses all of the features of the iPad, drawing readers in with personable, engaging video, clearly written text and interesting diagrams. The journey up from the smallest particles, past the moons and planets of the Solar System, out to the outer edges of the known universe truly blows my mind. I find myself in utter awe that scientists can understand, test and prove this knowledge. As The Other Media's managing director George Crabb says in a Guardian article, "We threw out conventional thinking on multimedia experiences to instead come up with a revolutionary platform that can take complex narratives but deliver them with an intuitive clarity." This is an app for older high school students and adults who are fascinated by physics and astronomy, and who want to explore how multimedia technology can help us understand these subjects. I must admit that I do not understand all of what I am reading in this app, but I am fascinated nonetheless! 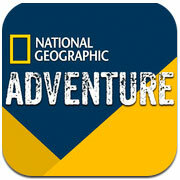 Nonfiction Book Apps show that this media has great potential for drawing readers into interesting topics. I am glad that several were nominated for the Cybils Award this year. Tune in on January 1st to the Cybils website to find out which apps are chosen for this year's shortlist. The apps reviewed here came from both promotional codes sent by the developers and our school app library. The Berkeley Public Education Fund has graciously supported our school as we explore how apps help children learn and engage with a range of books. Children's books are full of orphans who set out on a hero's quest - and yet there is something fundamentally appealing about a young child who sets off on his or her own to battle unlikely odds. Rownie, a street urchin in Zombay, must outwit a tyrannical witch, the vigilant mechanical policemen and his own friends as he searches for his lost brother in Goblin Secrets, William Alexander's National Book Award winning fantasy for older middle grade readers. Rownie flees the custody of the tyrannical witch Graba to join a troupe of goblins who perform magical shows with masks, fire and giant puppets. In the fantasy world of Zombay, all performances by humans with masks have been outlawed, and so Rownie's decision carries tremendous risks. But he is determined to follow the footsteps of his older brother Rownan. William Alexander's fantasy is both compelling, fast-paced and intricately layers. The setting is both unique and full of references to folklore. I loved the character of Graba, a Baba-Yaga inspired witch who is a "grandmother" for many orphans, with gear-work chicken legs. The writing was elegant and vivid - I was completely swept away by the story and the descriptions. Goblin Secrets has many layers and themes that kept resonating with me, some successfully and others less so. I was intrigued by the sense that masks allow us to create a new personality but that they can also have power in and of themselves. I think children will really respond to the themes of choice, courage and the need to take action. I found that the end of the story whirled so quickly that I had trouble digesting and understanding all of the threads. This is definitely a book that I will want to come back to. I look forward to sharing Goblin Secrets with students who like fast-paced but layered fantasies, like Jonathan Auxier's Peter Nimble or Rick Riordan's Heroes of Olympus. 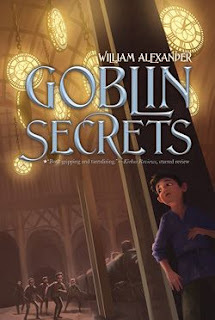 William Alexander was awarded the National Book Award for Young People's Literature for Goblin Secrets - a tremendous honor for his debut novel. Find out more about him at this interview at The Nerdy Book Club blog. There are times I just want to run my fingers over a picture book's page, wondering in the beauty of its artwork. 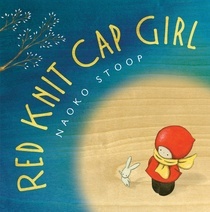 Red Knit Cap Girl, by Naoko Stoop, drew me in right from the start, with the beautiful grains of wood surrounding the sweet little girl. My 2nd graders and I read this as part of our Mock Caldecott unit, talking about some of the best new picture books this year. My students found Stoop's artwork enchanting in a quiet, soothing sort of way. They noticed the way she uses many different shades and gradations of color. Sometimes the grain of the plywood shows through the soft, transparent paint, and other times the color is rich and vibrant. The story spoke to them, reminding them of other stories they love, like Kitten's First Full Moon, by Kevin Henkes. Young children are enchanted by the moon, the way it changes each night but is always there. The way it seems so close and yet so far away. I like the way Mrs. Heise notes the way Red Knit Cap Girl's friends all come together as a community to help her. I agree with her that the language is not as fluid as the artwork; the name Red Knit Cap Girl is a bit choppy to keep saying over and over again. Over at the wonderful Seven Impossible Things Before Breakfast, Jules describes Stoop's artwork as "elegant in its simplicity," noting that she uses simple shapes, comforting curves and minimalist facial details to convey a magical, comforting tale. This year, I am reading four different books to each 2nd grade class. At the end of the four weeks, they will vote on their favorite book. Then we will share our favorites with the other classes. Throughout the process we will talk about what makes wonderful picture books, how we need to think about the story and the illustrations. In the meantime, our 1st graders are reading a wide range of Caldecott Medal and Honor books (you can see the whole list here). They are sharing with each other, practicing thinking and writing about books. Then our 1st graders will share their favorites with our Skype buddy class in Lynnwood, Washington through the help of Mrs. Valerie Stein. We're very excited to be reading such wonderful books and having an authentic way to practice our public speaking skills! The review copy was kindly sent by the publishers Little, Brown. If you make a purchase using the Amazon links on this site, a small portion goes to Great Kid Books (at no cost to you!). Thank you for your support. Do you have any special holiday books that you read every year? Here are some of my favorites from this year. Some honor the spirit of giving, while others tell traditional religious stories from a child’s perspective. All celebrate the warmth, love and togetherness we feel during this time of year. Award-winning artist Bryan combines colorful, vibrant illustrations in strong, bold strokes with a touching poem about the Nativity story from a child’s point of view. The rhyming text follows a young shepherd who builds a stable for his animals and then invites Mary and Joseph to stay on this fateful night. Many families will relate to the way Sadie’s family blends different holiday traditions. They scatter Hanukkah gelt underneath the Christmas tree and hang candy canes from the menorah on the mantelpiece, focusing on the joy of spending time together. San Francisco author Underwood teams again with Liwska to celebrate quiet, small moments, focusing on the many emotions that come with the holidays. “Reading by the fire quiet” and “listening for sleigh bells quiet” will bring readers back to those special moments we remember year-round. Here is a lovely preview of The Christmas Quiet Book from Google Books. For more holiday books to share, head over to my article in this month's Parents Press. 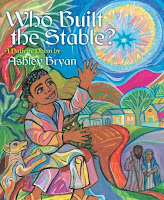 The review copy of Who Built the Stable came from our home library. 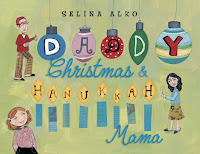 Random House kindly sent a review copy of Daddy Christmas and Hanukkah Mama. 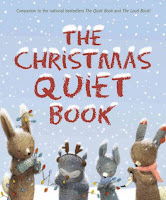 Houghton Mifflin kindly sent a review copy of The Christmas Quiet Book. If you make a purchase using the Amazon links on this site, a small portion goes to Great Kid Books (at no cost to you!). Thank you for your support. 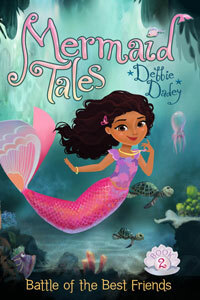 Our 2nd and 3rd graders are loving Debbie Dadey's new series, Mermaid Tales. If you are looking for a friendship story for a girls who's read all the Rainbow Magic books, this might be a nice choice for you.And since this is the holidays, I always try to find gifts that might make a nice pairing with books - here's a fun, sparkling ball to include for your mermaid loving 8 year old. Best friends Shelly, Echo and Kiki are all third-graders at Trident Academy. They share fun times and help each other through struggles that many kids will relate to: anticipating the first day of a new school, dealing with a difficult classmate who thinks she's the best at everything, being the only one not invited to a special party. In Battle of the Best Friends, Echo is invited to another girl's birthday party but Shelly isn't. The friends must figure out how to deal with this difficult situation. If you're looking to pair this with a fun gift, look for a mermaid themed toy. You might try the Play Visions Mermaid Ball. My kids have loved these types of hi-bouncing balls. 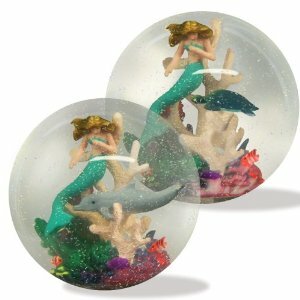 With these mermaid decorations inside, it reminds me of a snow-globe, but actually is something kids can play with! For other holiday gift ideas, check out these ideas for giving books. For some more favorite chapter books, see my recommendations for favorite series for 2nd and 3rd graders. The review copies came from our home library (tested and loved by our 8 year old). If you make a purchase using the Amazon links on this site, a small portion goes to Great Kid Books (at no cost to you!). Thank you for your support. Do you have a little daredevil at home? 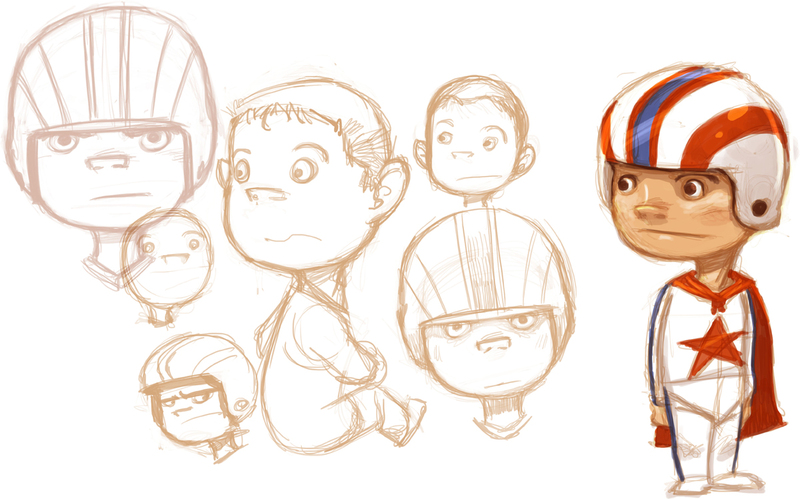 My nephew loves everything that goes fast, jumps high and makes loud noises. His dad's favorite hobby? Going to the car races. So we know where this little guy gets his passion! This holiday I'm going to make him a daredevil cape - bright red and shiny. It's going to be the perfect "go faster" special effect for him. But the book that I'm going to have tucked inside this cape? 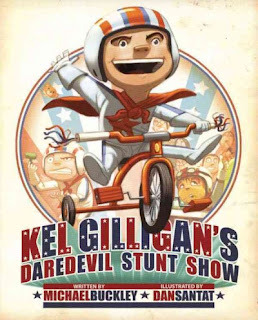 Kel Gilligan's Daredevil Stunt Show - it's a fun spoof on a little boy's quest to be a daredevil in his own right. Kel Gilligan is a daredevil - brave enough to attempt awe-inspiring feats like eating broccoli, facing "the Potty of Doom," and taking a bath with only ONE assistant. Santat's illustrations heighten both the drama and the humor in Buckley's story. You can tell just by the cover how much kids are going to love this. "Whether he is in underpants, in his caped stuntman outfit or bare-bottomed, young readers (and their grown-ups) cannot help but laugh out loud at the hilarious details of Kel's silly adventures because they tackle them daily and know them too well." It's interesting that Kel appeals most to kids ages 5-8 who are able to laugh at Buckley's exaggeration and understand that he's really making fun of these small achievements. They know that Kel talks tough, but is really soft inside - especially when it comes to checking for monsters under his bed. 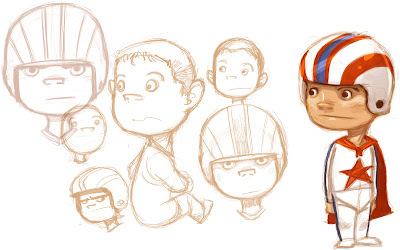 Take a look at Santat's early sketches for Kel - he had originally imagined him as a preschooler, but through editing changes it was decided that Kel should be older, perhaps around 5. 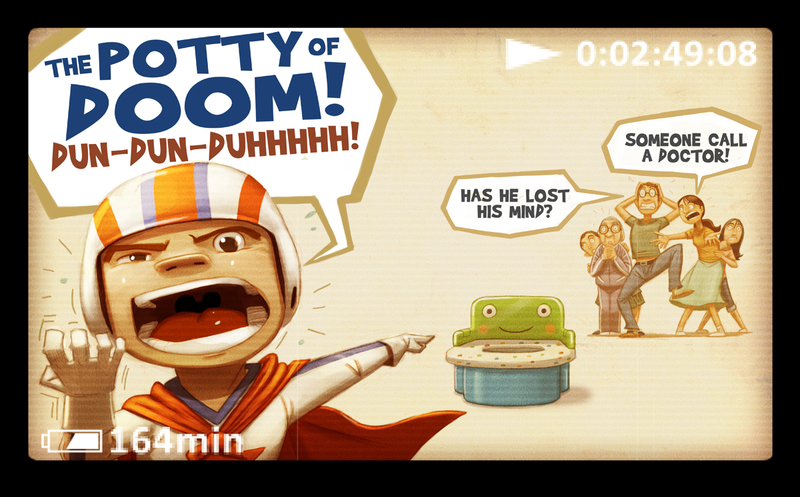 Santat developed the flashback device using the parent's videocam to recall the potty and broccoli scenes from Kel's younger days. My kindergartners were a bit confused at these transitions, but it did not detract from the overall impact of the hilarious scenes. If I can't get my act together to make a red cape, I think this one will do the trick just perfectly: Creative Edition's Red Adventure Cape. 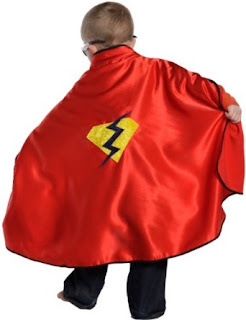 I must say that I have not seen this cape in action, but it's gotten great reviews on Amazon. The artwork is copyright © Dan Santat, shared by the artist. The review copy of this book came from my local review group, the Association of Children's Librarians of Northern California, and was sent by the publishers Abrams Books for Young Readers. Thank you to ACL and Abrams for sharing this very funny book. If you make a purchase using the Amazon links on this site, a small portion goes to Great Kid Books (at no cost to you!). Thank you for your support.